Here are some common questions about UV Natural. Sunscreens are filters of UV energy. They are used to filter a PROPORTION ONLY of UV rays. Myth: If you wear sunscreen you are fully protected from UV absorption and the suns harmful rays UVA and UVB and will not burn. Not true!! Sunscreens are a means to REDUCE ONLY a dose of sunburn you will get if you don’t wear it. Hence, as sunscreen is used to delay this burning affect and to filter the penetration of Ultra Violet activity. All sunscreens are labeled with a sun protection factor (SPF) number. This relates to the amount of time it takes for your skin to burn without any protection and how long it would take if you used the appro­priate amount of sunscreen. An SPF 15 product filters out more than 93% of the UVB in sunlight allowing about 7% penetra­tion. An SPF 30 filters out 97% and allows 3% penetration. So an SPF of 30 is not twice as effective as a 15, but rather it blocks out about twice as much of the penetra­tion. Stated differently it allows only half the UV penetration. Sunscreens are filters, not “blocks”. All of them will let some UV through at varying rates indicated by the SPF number. An SPF 30 product will permit 1/30th of the sunburning energy through it in the same time as it would take to suffer a minimal sunburn without any protection at all. The whole of this definition is important to understanding how they work. It is because the sunburning dose accumulates at 1/30 of the rate that it takes 30 times as long to see the skin reddening sign that damage has occurred and repair and recovery is underway. Sunburn may take hours to actually appear on the skin. Once you receive a dose of sunburn, no sunscreen or re-application is going to prevent this effect. This is why it is necessary to apply your sunscreen BEFORE sun exposure. Re-application of sunscreen is MAINTENANCE of the very first application. It does not prolong your time in the sun; it merely gives the first application a boost, enhancing its effectiveness. Tests carried out by our testing facility show that it will take from 6 to 10 minutes to receive burning from the sun without protection. This depends on the skin types, fair to olive. It also depends on how extreme the Sun/Heat is and varies for different Countries and States. Wearing an Spf 30+ product for example, in theory, will give you 30 times the protection before burning takes place. Re-application is necessary and recommended every two hours, due to the skin sweating or towel drying, time in and out of the sun over the course of the day, also prolonged amounts of time in the water. Advice: Cover up after this time, wear protective clothing, seek shade. We recommend that you cease sun exposure at this time. Re-application recommended after 2 hrs or towel drying and sweating, this boosts the effectiveness of the sunscreen for the remaining hour. Advice: Cover up after this time, wear protective clothing, seek shade. Re-application recommended after 2hrs or towel drying and sweating, this boosts the effectiveness of the sunscreen for the remaining 3 hours. * Halve these equations when using SPF 15 and multiply the minutes you think it will take your skin to burn un-protected by the SPF you choose to use. In short, if your sunscreen has protective qualities to give you 120mins in the sun, re-applying does NOT mean it will double to 240mins. Why do we need to apply sunscreen 25-30 minutes before exposure to the sun? The skin has seven layers, allowing the sunscreen to absorb into the skin before going out in the sun, will ensure its effectiveness; it allows it to set if you will. If you don’t apply before sun exposure then the sunscreen will still work, but not as well. You may have already burned, so this will show up later. The Australian standard for a sunscreen usage is that for a 60-70kg weight of person a minimum of 30gms should be used for effective sun protection. The Governing Testing facility advises that a dose of 2mg/square cm applied to one’s body is required for coverage of any sunscreen formulation. What are the ingredients in your sunscreen? When should I put sunscreen on? You should apply sunscreen generously and evenly about 30 minutes before sun exposure to allow the active ingredients to bond to your skin. A second application 20 minutes later will maximize the pro­tection from your sunscreen. Reapply every two hours or after swimming or sweating a lot. Does a product still work after it's expiry? Sunscreens contain ingredients that will eventually break down, compromising the effectiveness of the product. It is recommended not to use any product past a use by date. Always read the label and storage recommendations. Are UV Natural products safe to use on sensitive skin? UV Natural products have been astringently tested as per government requirements, for UVA/UVB protection, Efficacy and Skin Sensitivity. The skin sensitivity result for our products is 0.This means that UV Natural products have no sensitivity to the skin. It’s All Good!! What are UVC Rays? I notice that UV Natural have broad-spectrum coverage and understand that this covers protection from UVA and UVB Rays, does UVNatural products protect from UVC rays? “Most people are not concerned about UVC rays because the rays should be completely absorbed by theozone layer, however as the earth’sprotective shield is increasingly compromised, we are now at risk of exposure to these more damaging rays. UVC rays are carcinogenic; they are sterilizing rays that can kill small organisms. Only one UVC Ray has ever been detected and that was in Melbourne Australia. UV Natural test for UVA UVB and UVC protection. Whilst a UVC test cannot be performed on human skin, we have tested the spectrum for UVC transmission through our product. 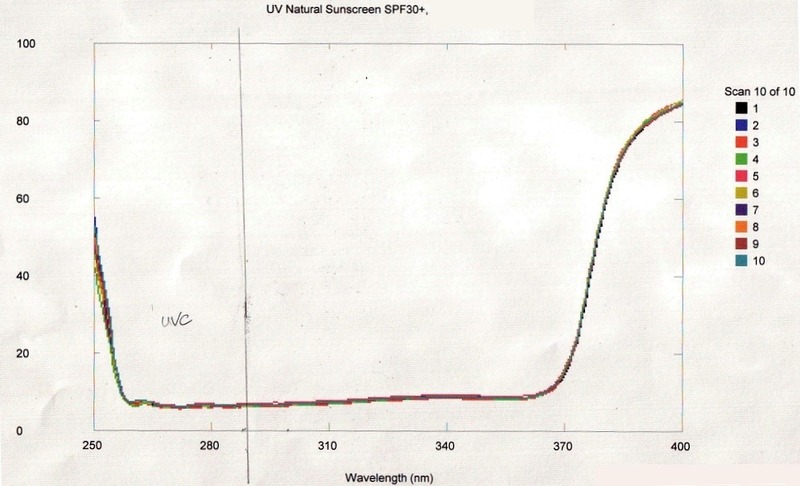 As you can see by the test result graph, the protection in the UVB region continues well into the UVC region and the SPF of our product is actually 47.4 and 30+ after 2 hour’s water immersion. How do I protect msyelf from UV? It is impossible to completely avoid sunlight and it would be unwise to reduce your level of activity because you don’t want to be outdoors. But there are precautions that you can take to limit your amount of exposure to UV. Why is UVNatural different in texture to other sunscreens and not as easy to apply? UVNatural is a Non Aqueous Formulation which means it does not contain water. Because of our unique self preserving system, UVNatural does not need to contain synthetic preservatives. UVNatural is made from naturally derived ingredients and oils making it’s texture and application obviously different to conventional solutions made with water. How can I remove UVNatural sunscreen from my clothing if I accidentally get some on them? You can try to remove any sunscreen stain with Sunlight Soap or Bicarbonate of Soda, both are natural and effective agents. Has there been a government review Nano Technology Safety?